Tottenham battles for Argentine midfielder against Manchester United, Arsenal, and Southampton? Random "Triffic" Blogs, Transfer News Comments Off on Tottenham battles for Argentine midfielder against Manchester United, Arsenal, and Southampton? Reports in Spain have suggested that Tottenham has joined the queue for Valencia midfielder Ever Banega as one of the most interested parties along with Manchester United. Arsenal and Southampton are also reportedly linked to this latest transfer battle. Last week, rumours began linking Banega with a move to Manchester United, but it seems like they are far from the only club interested. Banega’s agent Marcelo Simonian also stated that “several clubs” were interested. While Valencia are reluctant to let Banega – who showed incredible form this season after the departure of striker Robert Soldado – go, current financial troubles indicate that they will do so for a reasonable offer. Will Tottenham come out ahead on this one? Only recently, Arsenal boss Arsene Wegner rejected rumours and speculation that Arsenal was lining up loan moves for Alvaro Morata. Now Arsenal has sealed the deal for a six-month loan for the 21-year old striker. Not so great news for Tottenham, who also had an eye on Morata. Morata has made 12 appearances for Madrid this term but most of the time has been providing backup for Karim Benzema. A move to the Emirates would likely provide him with more first-team action. Arsenal could look to take Morata until the end of the season as they are keen to provide cover for central striker Olivier Giroud in January. The rumor mill refuses to die down on this one! Alvaro Morato, Real’s highly rated youngster, is being linked to a potential loan deal to White hart Lane. We desperately need another striker and Soldado simply has not lived up to his promise. Of course, news has emerged that Arsenal too have been keeping a tab on Morato. Its high time really that we get something back from our ‘ partnership’ with Real and this would be a good beginning. It also seems that Carlo Ancelloti is not too keen to part with Morato, at least not until, he can a secure another striker of quality for Real Madrid. Morato has two goals from open play this season, one more than Soldado, and could be a good prospect gong ahead. Could AVB be looking for two strikers to add to his roster this January? As rumors go, Fiorentina striker Rossi, who is in the form of his life scoring 11 goals in 13 league games, looks likely to shift base to White Hart Lane as well. Exciting and goal scoring times ahead for the spurs? I hope so. According to “Mail Online”, Tottenham have put in a £8m bid for Thomas Ince. The Blackpool player is the son of former England captain Paul Ince, who is also his current manager. Personally, is have no idea why we should waste £8m, when we have this position backed-up completely. How will Tom fit in at Spurs, if a deal goes through? What are your personal feelings about this young talent? It has been reported, that Schalke 04 have bid £5m for Emmanuel Adebayor. The same amount we bought him from Manchester City for. Nothing is certain, but we hope we can finally offload the striker that is killing our wage budget! The German side Schalke 04, are confident they can meet Adebayor’s wage demands, so what’s the problem then? Please lets just agree a deal for this cocky, arrogant striker! Daniel…you know what to do! All in all, I feel like a kid on Christmas morning with the progress of our beloved Spurs. Just read an article where, UEFA president Michel Platini thinks, the cost of players have gotten ridiculously high, and also thinks the transfer window lasts to long! Platini says: “I think transfers are a robbery – when I was playing every time I had finished a contract I was free to go wherever I went. I think it’s an opportunity for a lot of people to make a lot of money. What do you think? Have we gotten to a point where players are worth ridiculous sums of money? Do you think the transfer window should be shortened? Or is it time to get a new UEFA President? Any who, we still nailed it, this transfer window! Vlad Chririches, has finally signed the dotted lines, and become a new member of the Spurs! After a lot of back and forth, Vlad has finally signed, and is eligible to play against Arsenal this weekend! Now it’s only a matter of hours, before we can see the same photo of Lamela, or maybe Eriksen? BREAKING NEWS: Lamela And Chiriches to be presented at WHL Tonight! Just got news that both Erik Lamela and Vlad Chiriches will both be prestented at The Lane tonight! That is why Spurs have not made anything official on their site yet. GREAT! My source is an old family friend that used to play for the club. Hint: He’s Norwegian. 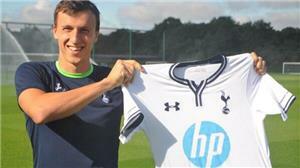 Vlad Is So Happy To Join Spurs! These are stone cold facts. I never lie when it comes to our dear Spurs! It’s actually going to be exciting to see a Europa Leauge match for a change, haha, kidding!! Spurs Agree Personal Terms With Eriksen! Marc Overmash confirmed this morning, that Spurs and Danish playmaker Christian Eriksen, have agreed terms , for his contract at WHL. The Truth Behind The Bale Saga – Is He Staying? The last couple of months, the media have bombed us with facts and fiction, regarding the transfer of our precious Gareth Bale. But can we believe everything the media tells us? At the end of the season, Bale expressed so much love towards THFC; Our supporters, my family development i London, my superstar status, and how A.V.B made me a better football player, by helping me enjoy my football. Spurs got a £50m loan from Joe Lewis. We have sold players for £23.3m, and bought for £87m ( Before a potential Vlad Chiriches deal ). We have also let players go, to save wages. All in all , Spurs also had a nice looking bank account from earlier years. My obvious point is that, if Mr.Levy really wants to keep Gareth ( For more reasons ,than only being one hell of a player ) this could really work. How much has this juvenile and attention seeking media brainwashed us? The only thing i can say is ; Lets see how our squad looks , after deadline day passes. It wouldn’t surprise me if our #11 Bale, is still in our squad by September 3rd. In Daniel Levy We Trust!